Dr. Melinda S. Kavanaugh holds a PhD, MSW and an LCSW with years of clinical experience across health care settings and populations, including neurological disorders such as Huntington’s disease, Amyotrophic lateral sclerosis (ALS), Parkinson’s disease and Alzheimer’s disease. Based on her clinical experience, Dr. Kavanaugh’s translational research focuses on an isolated population of caregivers - children and teens (“youth caregivers/young carers”). Dr. Kavanaugh conducts applied research in the United States and South Africa, working with families affected by neurological disorders including ALS, Huntington’s Disease, and Alzheimer’s disease. Results of her national study of ALS caregiving youth in the U.S. was used to develop national educational and caregiving materials for families with ALS. In the Milwaukee community, Dr. Kavanaugh received an NIH R21 award to conduct community-based research on the early warning signs and crisis points caregivers face in the Latino and African American community in dealing with Alzheimer’s disease. The NIH project and another funded by the Administration on Community Living (ACL) are a collaboration with the United Community Center, Alzheimer’s association and the Medical College of Wisconsin, addressing family dementia caregivers and cultural aspects of caregiving. Dr. Kavanaugh’s work extends to South Africa, where she is working with Stellenbosch University and the Motor Neuron Disease Association of South Africa (MNDA) on a two-year capacity building project funded by the ALS Association. This project engages current health care providers and community members to develop programming and supports for youth caregivers in ALS and other neurological disorders. 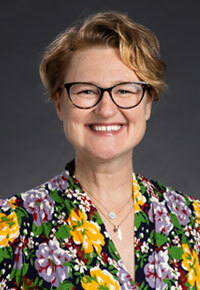 Dr. Kavanaugh has developed courses in social work in health care (SW 811, Advanced Practice in Health Care), and (Social Work 591, Introduction to Social Work in Health Care Settings), and teaches them along with SW 100, Introduction to Social Work. Additionally, Dr. Kavanaugh is part of an interprofessional collaborative with College of Health Sciences, where she co-leads a yearly workshop on IPE with social work, occupational therapy, physical therapy and speech language pathology. 2018-2020. Principal Investigator (PI). Alzheimer’s care management in minority groups: Identifying warning signs and crisis points in transitions from informal to formal care management in African American and Latino populations. Funder: National Institutes for Health, National Institute on Aging. R21 AG061307-01. Amount: $421,380.00. 2018-2021. Study Evaluator. Fortaleciendo Puentes: A Community-Based Continuum of Dementia Capable Care for Latinos. Funder: Administration on Community Living. Amount: 985,00.00, PI – The United Community Center. UWM - $91,360.00. 2018-2020. Principal Investigator (PI). YCare South Africa: Building community based ALS/MND caregiver interventions in South Africa. The ALS Association. Amount: $200,000.00. 2018-2019. Principal investigator (PI). Young caregivers, 24-hour rest-activity rhythm, and related psychosocial risk factors: A feasibility assessment. Funder: NIH/NCATS (Medical College of WI) Clinical and Translational Science Institute (CTSI). Start-up award. Amount: $12,500.00. 2017-2018. Principal investigator. Caregiving programs, development of professional materials and YCare trainings in ALS. Funder: the ALS Association. Amount: $71,448.00. 2017-2018. Principal investigator (PI). In-depth examination of opioid deaths in Milwaukee county. Funder: US Department of Justice. Amount: $75,000.00. 2017. Principal Investigator (PI). Development of youth guides and supportive materials. Funder: ALS Association. Amount: $30,000.00. 2016. Principal investigator (PI). Young caregiver training and intervention: Feasibility and baseline project development. Funder: ALS Association Outreach and Program Grant Initiative. Amount: $30,000.00. 2016. Principal Investigator/developer. Development of ALS youth programming, materials and education. Funder: The ALS Association. Funding to develop the first national manual for families living with ALS. Amount: $22,445.00. 2016. Principal Investigator (PI). MND caregiving in South Africa: Pilot assessment of family and youth caregivers. Funding to conduct research in SA around young caregivers and ALS. Funders: UWM Center for International Research. Amount: $7,800.00; International ALS/MND Alliance. Amount: $1,500.00. 2015-2017. Principal Investigator (PI). Family characteristics and youth caregiving experiences: A national pilot study of ALS caregiving. Funder: ALS Association, Clinical Management Grants. Amount: $50,000.00. Kavanaugh, MS., Cho, C., and Howard, M. (2019). “I just learned by observation and trial and error”: Exploration of young caregiver training and knowledge in families living with rare Neurological disorders. Child and Youth Care Forum. (in press). Dondaville, D., Hanson-Kahn, A., Kavanaugh, MS., Siskind, C., Fanos, J. (2018). This could be me": Exploring the impact of genetic risk for Huntington's disease young caregivers. Journal of Genetic Counseling. https://doi.org/10.1007/s12687-018-0395-z. Kavanaugh, MS., Howard, M., and Banker-Horner, L. (2018). Developing multidisciplinary caregiving training programs for young caregiving in families with ALS. Social work in Health Care, 57(1),1-12. Refereed. Kavanaugh, MS., Cho, C., Maeda, H., Swope, C. (2017). "I am no longer alone": Evaluation of the first North American youth camp for youth in families with Huntington's Disease. Children and Youth Service Review (in press). Kavanaugh, MS., Noh, H., Zhang, L. (2016). Caregiving youth knowledge and perceptions of parental end-of-life wishes in Huntington’s Disease. Journal of Social Work in End-of-life care, 12, 348-365. Kavanaugh, MS., Kalipeni, J Stamatopoulos, V. (2016). Application of the UN Convention on Rights of the Child to young carers in the United States: US policies in international context. Child Abuse Research: A South African Journal, 17(1), 68-81. Kavanaugh, MS., Stamaopoulos, V., Cohen, D., & Zhang, L. (2015). Unacknowledged Caregivers: A Scoping Review of Research on Caregiving Youth in the United States. Adolescent Research Review, DOI 10.1007/s40894-015-0015-7. Kavanaugh, MS., Kramer, B., Trentham-Deitz, A., & Walsh, M. (2015). Factors Contributing to Economic Burden in Lung Cancer Spousal Caregivers. Palliative and Supportive Care, 13(3), 691-700. Kavanaugh, MS., Noh, H., and Studer, L (2015). “It’d be nice if someone asked me how I was doing. Like, ‘cause I will have an answer.” Exploring support needs of young carers of a parent with Huntington’s disease. Vulnerable Children and Youth Studies, 10(1), 12-25. Kavanaugh, MS. (2014). Children and adolescents providing care to a parent with Huntington's disease: Disease symptoms, caregiving tasks and Young Carer well-being. Child and Youth Care Forum, 43(6), 675-690.